Now this is fascinating. Rather than an all-out evil character, it appears that Nagini’s transformation into a murderous snake wasn’t exactly her choice. While traveling in the Circus Arcanus, she simply entertains muggles and attempts to keep her humanity. But anyone who has seen the Harry Potter films knows that Nagini’s fate is decided. Claudia Kim’s comments to EW add another reason for Potterheads to be psyched about the upcoming Fantastic Beasts sequel. While the first movie largely functioned independently from the events of the Harry Potter franchise, the connections are forming in Crimes of Grindelwald. Many of them are shown off in the final trailer, including Hogwarts, the Mirror of Erised, and even Nicolas Flamel. 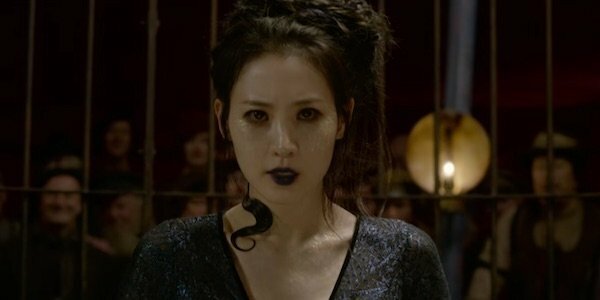 No one expected Nagini’s origin story, which Claudia Kim made clear is very tragic. Poor Nagini. Years before she began murdering beloved characters (SNAPE! ), Nagini was a young witch with a blood curse on her. It should be fascinating to see how she eventually becomes a horocrux for Voldemort. Maybe he and Grindelwald told her they’d cure her? Or maybe something traumatic happens that inspired Nagini into a life of evildoing and shedding her skin. She seems to be friends with Ezra Miller’s Credence, with the two both containing a power they can’t control.